Newry's Mark McCabe celebrates his goal against Coleraine. Mark McCabe’s first goal of the season proved enough for Newry City AFC to pick up not only their first win on the road this season, but also their first points away from home as they produced a plucky display to see off Coleraine. Newry had a great chance to take the lead almost straight from kick-off when Thomas McCann found Declan Carville midway inside the Coleraine half. He slipped the ball through to Mark McCabe, but the striker’s early shot was weak and straight into the arms of Chris Johns in the Coleraine goal. They were almost in again in the 12th minute when Carville slid the ball in for Stephen Hughes and while Johns came out off his line quickly, he could only cannon the ball off Hughes but it ran out for a goal kick. However, the longer the half wore on, the more the Bannsiders began to come into the game and Ciaron Harkin had their first real opportunity of the tie on 24 minutes when his curling effort from 22 yards was saved by City keeper Steven Maguire. Rodney McAree’s side then almost broke the deadlock on the half hour. After Josh Carson’s corner from the right had been cleared back out to the winger, his dangerous ball in was flicked on by Aaron Canning and Stephen O’Donnell headed goalwards, only for Stephen Hughes to clear off his own goal line ahead of Maguire. Nine minutes before the break, it was City who went in front with a superb finish from Mark McCabe. 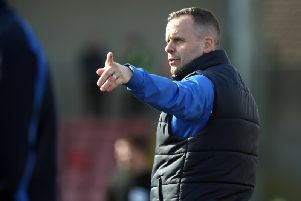 The striker, who was top scorer in the Championship during Newry’s promotion campaign last season but had yet to find the net in the top flight, opened his account in some style as he latched on to Dale Montgomery’s pass and, spotting Johns off his line, McCabe produced a fine lofted volley over the keeper’s head from 20 yards. While the hosts couldn’t find a leveller before half-time, with Gareth McConaghie’s long-range effort flying over Maguire’s crossbar, they almost got their equaliser a minute after the hour. This time Carson found space on the right-hand side of the box before cracking in a low left-foot shot that Maguire had to be alert to dive to his left and push out for a corner kick. However, it was the Newry who spurned a gilt-edged chance to double their advantage ten minutes from time. Once more, it was Montgomery who played the through ball, this time setting Stephen Hughes bearing down on Johns’ goal. The Coleraine keeper was equal to the forward’s effort with an excellent save before McConaghie produced an even better block to deny McCabe from the follow-up from 18 yards. Four minutes later, McCabe then put Carville’s low cross from the right just over the bar from close range as Darren Mullen’s men looked to seal a big three points. But they didn’t need to find a second goal as they held on for the victory.